F2B Stunt, Classic & Warbird Stunt, 27 Goodyear Team Race. It was a big day down at the Frankston flying field on Sunday, 9th November. 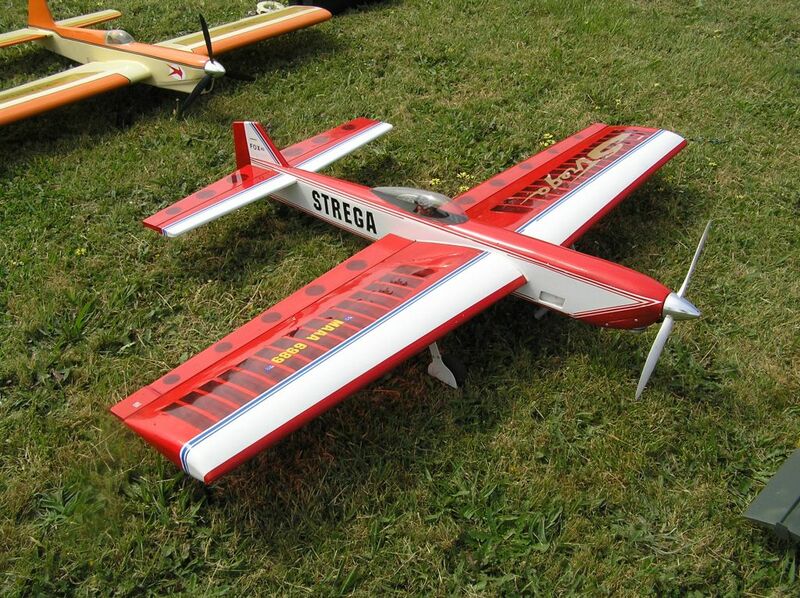 'Strega' a modern F2B stunt model. Stunt was the go with competitions being held for F2B Aerobatics and the long awaited Warbirds competition that was to flown to the Classic pattern. It seems Classic Stunt was also combined with the Warbirds. It was great to see such a large number of stunters lined up and ready to fly at CLAMF. Combined Speed and 27 Goodyear were also flown. Weather was reasonable with a constant southerly breeze that had the unfortunate effect of carrying dust across from the mini bike track next door. The cars in our field were covered with fine dust and the conditions for running model engines was far from ideal. Hopefully we can encourage the bikes management to be more pro-active with track watering on future days like this. Six Warbirds lined up on the freshly mown grass surface. There are lots more models still under construction so next years event should be a beauty! Can’t wait to get a look at Paul Stein’s when it’s finally finished… Today Paul flew his Nobler instead. F2B specialist Mark Ellins had his ST-46 P-40 flying very smoothly and it was no surprise that he scored the highest points. John Hallowell also had the same ST-46 P-40 combination but forgot the reverse wingover (senior moment) in the first round and ran out of fuel in the overhead eights in round two. There’s always next time! Andrew Nugent’s very smart silver Mustang and Enya 35 showed the benefits of practice and having everything nicely sorted out. His third place in the Warbirds reflected that. Was great to see Peter Koch from KMAC at the field. Just a pity a few more didn’t follow his good example. After all, there are always lots of CLAMF modelers at Knox for their competitions. Peter had a few issues with his Fox 29 Stuka including an early engine cut, but is sure to bounce back better than ever next time. Harry Bailey enjoyed the day but his Fox 25 P-40 flight was not able to reach full potential. F2B was next. It was flown on the north circle, which gave some respite from the dust clouds. Again it was Mark Ellins who showed the way with his smooth flying ex Doug Grinham ‘Jazzer’. Murray Wilson showed his versatility and talent by putting in two very nice flights with his SV11. Paul Stein’s Nobler was again in the mix with a flight good enough to take 3rd place. Peter Koch ‘s Strega wasn’t performing at its best and Andrew Nugent’s effort in flying the F2B pattern for the first time with his Nobler was worthy of high praise. Everyone who flew aerobatics on this memorable day certainly enjoyed carving up the air into little circles. Thanks to judges Peter Roberts and Graeme Wilson for doing a top job..
To wind up the day’s program, it was time for 27 Goodyear. Only three teams took part and two rounds were flown. Graeme and Murray Wilson recorded a very fast 5.07.22 with a Super Tigre G20D. Paul Stein and Mark Ellins were going well until the last tank of the first heat. It was then that Paul noticed the broken fuzz… right behind the wing and severely hampering the down control. Paul could see the crack from the centre circle… Scary stuff! Harry Bailey and Peter Roberts were using a Nelson and easily getting all the necessary speed. The final was a two up and went all the way down to the wire with Harry and Peter just pipping the Willows at the post by the slender margin of about two seconds. Top racing, lads! With only a couple of Classic entries it was decided to combine Classic with Warbird Stunt. Mark was high scorer with his ST46 powered Brodak P40 Profile, followed by Paul with his B40 powered Nobler ring in. Andrew and John were also flying Brodak Profile Warbirds, Andrew with an Enya 35 powered Mustang and John with an ST46 P40. Peter had a few problems with a couple of dodgy engine runs from the Fox 29 in his neat Don Still Stuka, while Harry had a wild ride from his twitchy Fox powered Goldberg P40 in the gusty conditions. The windy conditions were a bit of a challenge, although everyone seemed to cope reasonably well. Once again Mark was top scorer with a Stalker 61 powered Jazzer. Murray’s ARF SV11 with a Stalker 61 up front stayed in one piece this time! Murray could be a bit of a dark horse in future stunt comps. Paul handled the wind pretty well with his Brodak40 Nobler, while Peter’s nice looking PA75 powered ARF Strega seemed to suffer a bit in the windy conditions in spite of all that grunt up front! Andrew rounded out the comp with his ARF Nobler powered by an OS LA46 which is probably the best bang for buck stunt engines around.